The Hitchhiker's Guide to Python takes the journeyman Pythonista to true expertise. More than any other language, Python was created with the philosophy of simplicity and parsimony. Now 25 years old, Python has become the primary or secondary language (after SQL) for many business users. With popularity comes diversity—and possibly dilution. This guide, collaboratively written by over a hundred members of the Python community, describes best practices currently used by package and application developers. Unlike other books for this audience, The Hitchhiker’s Guide is light on reusable code and heavier on design philosophy, directing the reader to excellent sources that already exist. There are 1 reviews for this book on GitHub. Hendeca left a review on GitHub 1 year ago. I was quite excited when I came across this book, as I've always felt that there needed to be more books that dealt with best-practices, useful libraries, code style, and other information that one discovers through years of coding experience. Even for languages that I've had quite a bit of experience with, I'll still come across a great library or helpful technique that I wish I'd learned years earlier. I got this book fairly recently. At this point, I know the ins and outs of Python fairly well and feel comfortable writing complex programs. That said, I don't have a lot of experience making my Python code available to other developers, and I feel there is a lot left for me to learn about how to get my code in tip top shape, making it maintainable, readable, and easy to contribute to. 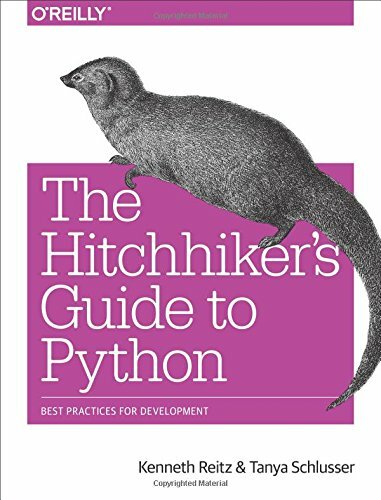 There are some gaps in my Python knowledge, and I've found that this book serves as a fantastic starting point when I want to learn more about a specific aspect of Python development and take my skills in that area to the next level. Draws inspiration from the fantastic, hilarious, witty sci-fi novel The Hitchhiker's Guide to the Galaxy by Douglas Adams. Read this book? Comment on this book's GitHub issue page and share what you liked and what you didn't like about it. Your GitHub comment will show up as a review here.